The first recipe I tried was shrimp lettuce cups. Believe it or not I obtained this recipe from Party City. (You know the decoration store?) It amazes me that they are now providing customers with culinary advice, but the recipe turned out pretty well. I don't eat shrimp, so I had a vegetarian version, but I heard they were tasty. Basically it consists of marinated grilled shrimp laid in a bed of fruit salsa and garnished with cucumber, green onion and carrots. The complete recipe can be found here. Combine all of the ingredients together and set aside in the fridge while you grill up the shrimp. The last step is to take your shrimp and grill them. 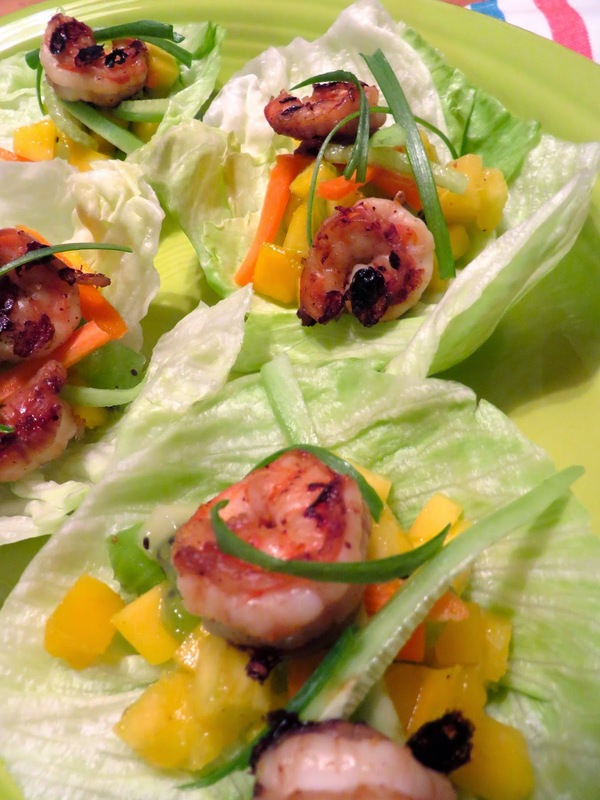 After shrimp are cooked, take the leaves of a head of iceberg lettuce to use as "cups". Scoop a small portion of the fruit salsa into the bottom, arrange the shrimp over the salsa, and garnish with julienned carrot, cucumber and green onion. First preheat the oven to 375 degrees. Next get large chunks of pineapple. (I used fresh, but you can save some time buying canned.) Wrap each pineapple chunk with half a slice of bacon. I dredge the bacon through the brown sugar first for added sweetness. 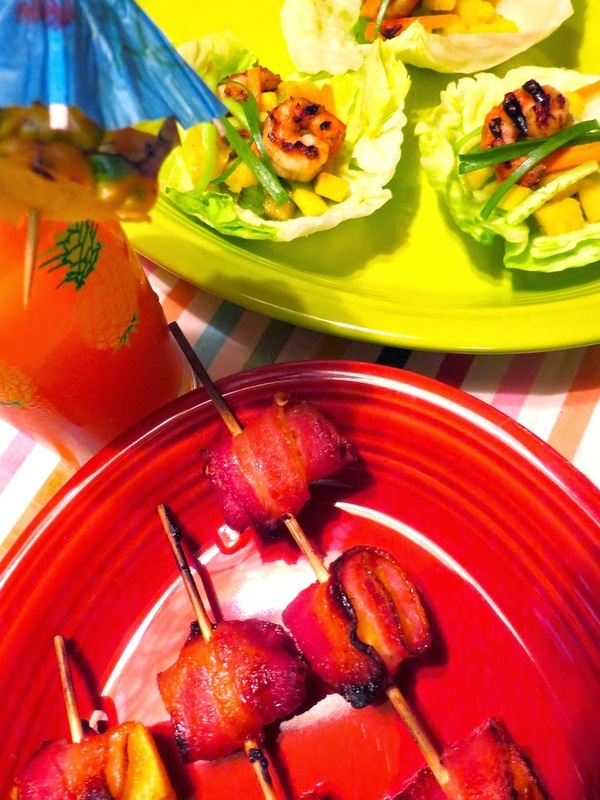 Last of all, put the bacon/pineapple chunks on a skewer and then place the skewers on a cookie cooling rack on a foil lined baking sheet (so that the drippings can gather and not cause a mess that your husband will inevitably clean up). These will cook for about 25 minutes. After 25 minutes I turned the broiler on to get a little added crispness to the bacon. 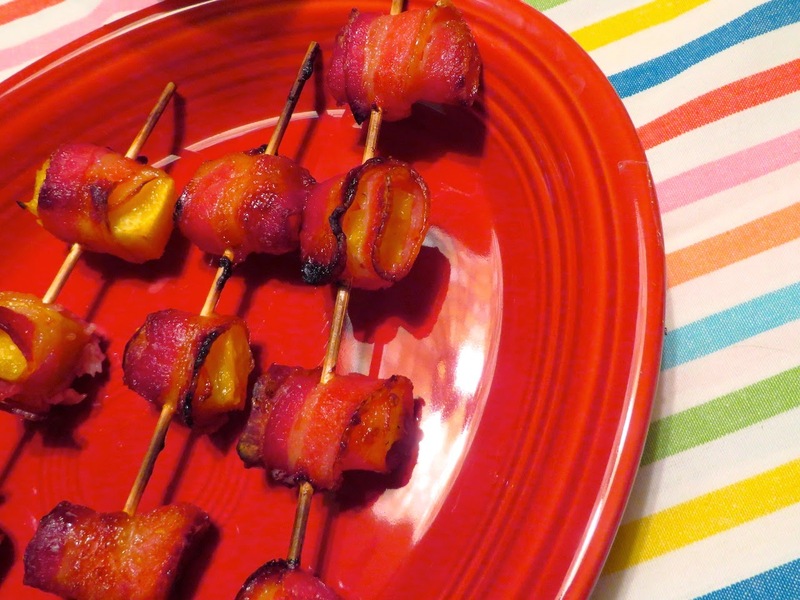 When you are done you will have yummy chunks of pineapple wrapped in crisp, delicious bacon. These were also a real hit! As a side note, you might enjoy the fact that William got dressed up for the Tiki party. Below you will see him donning a grass skirt and Hawaiian lei. He even was able to sneak a few of the appetizers too! I love themed parties - the food looks delicious and William looks so handsome!